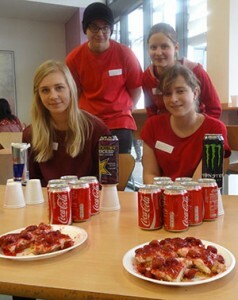 First year Applied Health & Social Care students tackled a wide range of issues affecting all sectors of society for their recent health promotion projects, with one group challenging the little-known risks of caffeine addiction head on. Caffeine stimulates the nervous and cardiovascular system, elevating mood in the short term but creating long-term health problems including irritability, anxiety, headaches, depression and premature ageing. Addiction is swift and the high energy drinks responsible for many of the symptoms seen in teenagers also contain alarming amounts of sugar. The students illustrated the dangers in a single can of Monster by comparing its caffeine content to seven cans of Original Coca-Cola and the sugar kick to four generous portions of cheesecake. The US-based Monster brand is marketed as ‘the meanest energy supplement on the planet…a wicked mega hit that delivers twice the buzz of a regular energy drink’.